Certified solar eclipse viewing glasses block the sun’s rays, allowing you to look directly at the sun in broad daylight and during a partial eclipse. 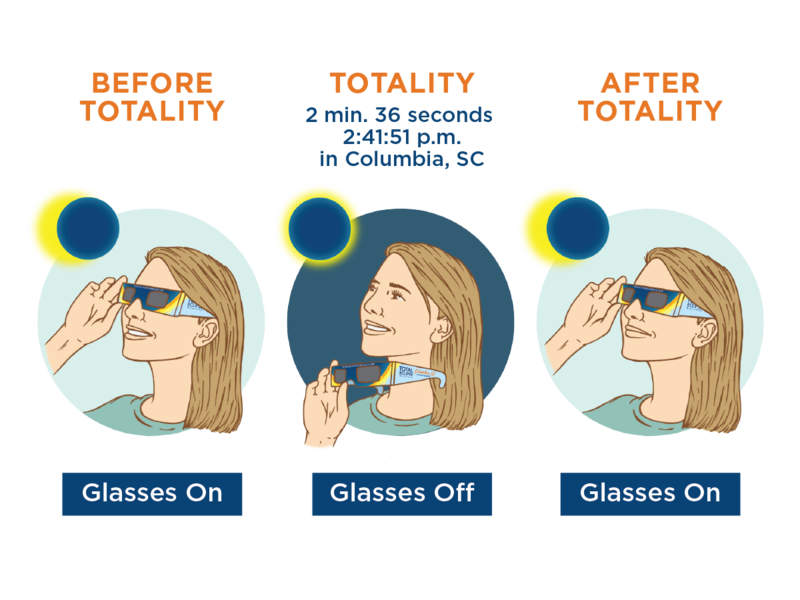 The City of Columbia, S.C., is enabling the Total Eclipse Weekend Columbia, S.C. campaign to provide 100,000 free pairs of certified eclipse safety glasses, which will be distributed via the majority of the 120+ local eclipse events listed at http://www.totaleclipseweekendcolumbiasc.com. Each event listing notes whether free eclipse glasses will be available for guests. Bulk orders of an additional 184,400 safety glasses were purchased using the campaign’s wholesale discount rate by Midlands event hosts, organizations and private businesses. Thanks to event hosts and additional sponsors of individual events, a significant number of these bulk order glasses will be given away to guests of eclipse day viewing events, thus adding to the inventory of free eclipse glasses being distributed by eclipse events across the region. View the list of events offering free glasses to guests while supplies last: http://totaleclipsecolumbiasc.com/glasses/events-with-free-eclipse-glasses. All eclipse safety glasses ordered via the Total Eclipse Weekend Columbia, S.C., campaign were manufactured by San Diego company Rainbow Symphony, one of the most reputable NASA- and AAS-endorsed suppliers. Organizers have worked closely with Rainbow Symphony since Summer 2016, when the Total Eclipse Weekend Columbia, S.C. campaign steering committee first came together. Viewers should not be afraid to remove their glasses once darkness falls; in fact, this is the only way to witness the phenomenal effects of totality. However, solar viewing glasses should be worn if viewers wish to look directly at the sun before and after totality. 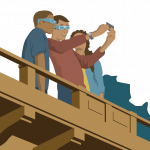 View NASA guidelines for eclipse viewing safety here: https://eclipse2017.nasa.gov/safety. Roughly 25 of the 120+ events listed at http://www.totaleclipseweekendcolumbiasc.com can serve between 3000 and 10,000 guests, while roughly 35 of the events can serve between 500 and 3000 guests. Some events, on the other hand, are small, intimate gatherings, such as the sold-out Eclipse on the Congaree River kayak trip hosted by Carolina Outdoor Adventures, where 15 lucky ducks will enjoy the serenity of the river during nature’s grandest spectacle. Others are huge, like the sold-out Solar Eclipse Day at the South Carolina State Museum, which will host 3,500 guests including visitors from 23 states and Washington D.C., as well as 8 countries including Sweden, the U.K., Italy, Japan and Hong Kong. 12 events are confirmed as sold out thus far. Event submissions were accepted from regional event hosts for promotion via the Total Eclipse Weekend Columbia, S.C. campaign between November 14, 2016 and July 14, 2017. Requests for complimentary eclipse glasses were accepted from event hosts through July 21, 2017. Many eclipse day viewing events still have tickets for sale, including large eclipse viewing events such as the Soda City Eclipse Viewing Festival in Cayce, S.C., where organizer John Banks has seen ticket purchases from 29 states including the entire Eastern Seaboard, California and Oregon. Other large-scale, ticketed events include the Columbia Fireflies baseball team’s Total Eclipse of the Park; the Eclipse Extravaganza at Saluda Shoals Park; the Total Eclipse Tailgate at the S.C. State Fair; the Yonder Field Solar Eclipse Festival in Bowman, S.C.; and the Grape Eclipse Festival at Mercer Winery in Lexington. There are tickets available for many pre-eclipse events throughout the long weekend as well. There are a number of large-scale free viewing events as well, including the Benedict College Total Solar Eclipse Experience, featuring the Solar Games; Total Eclipse Viewing on the “Centerline” at Lexington County Blowfish Stadium; the Solar 17 celebration at Lake Murray; Solar Fest West at the Riverwalk & Amphitheater in West Columbia; Newberry EclipseFest in downtown Newberry; Blythewood’s MOONDOGGLED! Battle of the Bands at Doko Meadows Park; the Main Street District’s free viewing event at Boyd Plaza; and free, public viewing events at four City of Columbia parks, Riverfront Park, Finlay Park, Owens Field Park and Southeast Park. View eclipse event listings here: http://totaleclipsecolumbiasc.com/event. One of the most vibrant mid-sized cities in the Southeast, Columbia, S.C., has been identified as one of the top places in the nation to experience the total solar eclipse by astronomy experts and has been covered by national media outlets such as The New York Times, USA Today, Newsweek, Buzzfeed, Fodor’s Travel, the Washington Post and more: http://totaleclipsecolumbiasc.com/in-the-news/. Thanks to an early alert in 2013 from the South Carolina State Museum’s astronomy and education staff that the 2017 eclipse would be a very big deal, as well as a sizable reminder in the form of a USA Today article noting Columbia, S.C., as a top nationwide eclipse viewing destination in October 2015, South Carolina State Museum marketing director Merritt McNeely worked with her team to rally a regional coalition in Spring 2016, which activated a regional eclipse tourism campaign in Summer 2016. The world is buzzing about the eclipse, and Columbia, S.C., is at top of mind for many in the conversation. Deemed the “Total Eclipse Capital of the East Coast,” Columbia, S.C., will experience the longest period of totality of any metro area on the East Coast. Columbia, S.C. is the third largest city on the center line of the path of totality, making it an even more appealing place to be during the total solar eclipse. 30 counties in S.C. are within the path of totality. On August 21, a 70-mile wide swath of twilight-like darkness will engulf the Midlands region for a period ranging from 2.5 minutes to 2 minutes and 36 seconds as the moon’s shadow passes over the state of South Carolina at a speed of 1,500 to 1,700 miles per hour. At the S.C. State House at Gervais and Assembly, totality will begin at 2:41:51 p.m. and end at 2:44:20 p.m. Check your exact time of totality at http://www.eclipsecountdown.com. Of the 1 million visitors estimated to visit the state of South Carolina by NASA, hundreds of thousands are expected to experience the Columbia, S.C. area during this once-in-a-lifetime event. Already, based on 2015 data, the Columbia, S.C. metropolitan statistical area (MSA) totals more than 810,000 residents, encompassing the following counties: Richland, Lexington, Kershaw, Calhoun, Fairfield and Saluda counties. While many of the area’s hotels are booked, some of the region’s 120+ hotels (encompassing just over 11,600 rooms) may have availability via phone. Locals are stepping up to open their homes for vacation rentals via www.AirBNB.com and www.VRBO.com; new listings are being added daily by gracious hosts. Restaurants that are normally closed on Sunday and Monday are opening to welcome eclipse guests, increasing their revenue opportunities, such as Motor Supply Co. Bistro and Terra, two of the region’s top chef-driven restaurants. State and local law enforcement agencies have been planning for months for the eclipse and have plans in place to ensure a smooth experience for visitors and residents alike. Check traffic at http://www.511sc.org and view the South Carolina Emergency Management Division (SCEMD)’s eclipse safety tips here: http://www.scemd.org/totaleclipse. City of Columbia parking decks will be available for cash purchase throughout the weekend and parking enforcement at meters will continue as normal on eclipse day. Visitors are encouraged to download the Passport Parking app to make metered parking easy: https://ppprk.com/park. Viewers will not be allowed to gather to watch the eclipse from the top level of City of Columbia parking garages, as the safety exits of parking garages were not built to accommodate large crowds. Plan your summer eclipse vacation at http://www.totaleclipsecolumbiasc.com and experience the “Great American Eclipse” in the Real Southern Hot Spot: Columbia, South Carolina. About the Total Solar Eclipse in Columbia, S.C.
One of the Southeast’s most vibrant mid-sized cities, Columbia, S.C., is home to the longest total solar eclipse for a metro area on the East Coast and will host Total Eclipse Weekend Columbia, S.C., a long weekend of more than 120 eclipse-related festivals and events, from Aug. 18 to 21, 2017. At 2:41 p.m. on Monday, August 21, 2017, viewers in the greater Columbia, S.C., area will experience up to 2 minutes and 36 seconds of darkness in the middle of the afternoon. NASA estimates that South Carolina could see an influx of up to 1 million visitors to witness the U.S.’ first transcontinental total solar eclipse in 99 years. The Columbia, S.C., region’s long weekend of eclipse events includes a variety of large and small festivals; kid-friendly/family activities; food & drink parties; outdoor river and lake adventures; education, science & history events; art, film & music happenings and more. Dubbed the “Total Eclipse Capital of the East Coast,” Columbia, S.C., has been named a top U.S. viewing city, with coverage by the New York Times, USA Today, Newsweek, Buzzfeed, Fodor’s Travel, UK’s Telegraph, Forbes, the Chicago Tribune, the Boston Globe, the Washington Post and others. Follow @TotalEclipseCAE and plan your Total Eclipse Weekend Columbia, S.C. at http://www.totaleclipsecolumbiasc.com. Total Eclipse Weekend Columbia, S.C. is a regional tourism campaign that was founded to create economic impact in the Midlands by inspiring local groups to host eclipse events and amplifying their efforts with a national public relations and marketing campaign, raising awareness of the Columbia, S.C. area as a vibrant, authentic destination filled with cool things to do all year round.